The site is easy to register and once connected, users are able to click on tabs to get to pages of interest like: photos, matches, interests, personality, and more. For instance, members simply click and scroll to check off interests and mouse click to upload photos. There is also a form that is expected to be filled out by members this is based on the International Marriage Broker Regulation Act (IMBRA). There are many photographs to view once logged in. 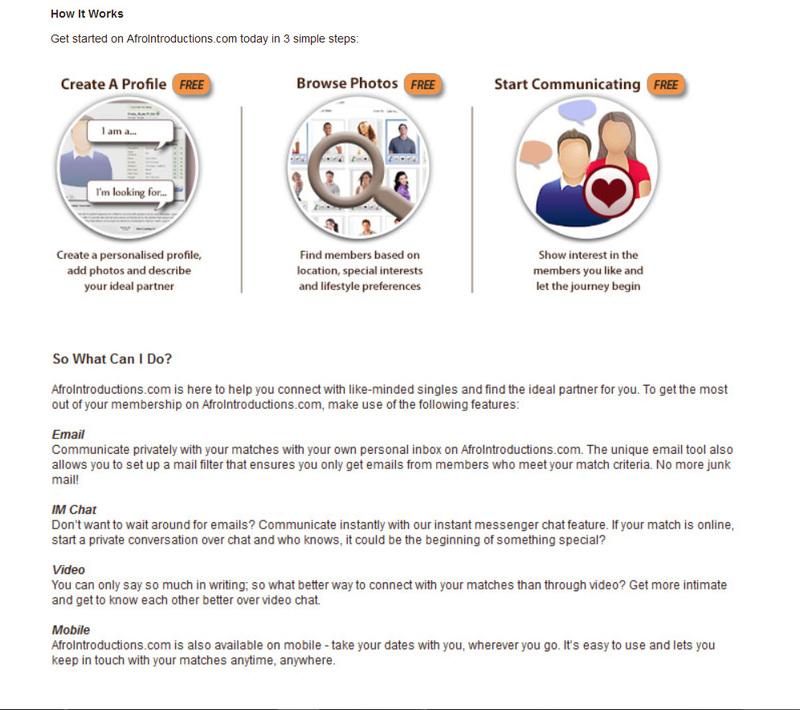 Afro Introductions singles communicate via email. Filters are also provided to help with organizing mail. IM Chat is available at the site too. This feature allows users to communicate live with one another. Singles have the option to connect with one another via video. This is a great way to see and hear a potential date. All of the features were well-liked by current members and many had positive comments about the dating service. In addition, Afro Introductions is available on mobile so that singles can communicate from anywhere. But there is a drawback to meeting singles online, many on this site are international willing to meet, but making arrangements can be somewhat of a challenge, according to some users. Like with many other dating websites, another issue is the free service has limited features. For instance, non-paying users are not able to translate messages, send or read emails, use instant messaging or video chat. Further, they are unable to upload video greetings or customize their profiles. They also can't be featured and viewing video profiles are prohibited. Free members can purchase their choice of a Gold or Platinum membership. A few features are limited with the Gold Plan. However, the Platinum members are able to utilize everything. With premium features, members are able to enjoy their experiences with no ads and use search with advanced options. There are 1, 3, 6 and 12 month plans. Also new discounts, coupons and limited-time offers are available periodically. A 25-year-old woman commented, she liked Afro Introductions and talked of hoping to meet someone special. She did share that a guy she dated, paid for a six-month membership for her. The overall appearance of Afro Introductions is professional. One user stated, "It is a good way to find love and is the best-love it!" To date, there are slightly more women than men on the site. Many of the members attend college and browse from their school locations. Most speak English well, but for those who can't, there is a translation tool. Members can also view articles on dating and safety. This information assists readers with their date search and experiences. For men who are curious or are serious about meeting African women, this is a well-managed site. But be forewarned, as with other dating sites, there are those who are more interested in taking foreign men for their cash then marrying them.